You might be reading this, thinking what is she thinking? DIY’ing your own ice pops at a summer wedding? Surely they will melt? Well it’s actually not that crazy! The great thing with ice pops is that they can be made way in advance and stored in a freezer and they can be served easier than your think? Some sort of refrigeration will almost definitely be needed but you could have friends and family help with serving them up at your wedding, taking them straight from the freezer and placing in metal buckets topped with layers of ice, or just get your guests to help themselves straight from the cart. 1. Strawberry Milk Ice Pops: Quick to make, dipped in white chocolate and covered in sprinkles, these strawberry milk flavored ice pops are deliciously creamy and will be sure to make your guests feel a little nostalgic. 2. Boozy Coconut Fla-vor-Ice Freeze Pops: Your guests will overjoyed when you present them with this boozy version of their favourite childhood summer treat! 3. End of Summer Grapefruit Popsicle Recipe: The pretty pink and orangey colour scheme is perfect for a wedding and would make the refreshing treat for your guests on a hot summers day. 4. Mint Julep Popsicles: A unique twist on the traditional mint julep cocktail, these boozy popsicles are made with Kentucky bourbon, simple syrup and mint, a flavor that is pretty much synonymous with special events and big fancy hats. 5. Funfetti Creamsicles: Anything that involves sprinkles is our fave and these funfetti popsicles are no exception. Fruity and creamy at the same time, we know this recipe would be a huge hit with your guests. 6. Rhubarb & Elderflower Ice Lollies: Made by simply pouring your favourite natural juices into a mould and freezing with a dash of food coloring for vibrant colour. Quick and simple to make, your guests wont believe their taste-buds. 7. Cherry Merlot Popsicles: Did somebody say winesicle? Made with a smooth red wine and fresh pitted cherry’s this is every adults dream ice pop. You’ll be hooked! 8. Strawberry Shortbread Popsicles: These ice pops are so darn good you will be reaching for another in no time. 9. Banana Split Pudding Pops: A banana split on a Popsicle stick? HELL YEAH! 10. Caramelized Honey & Sea Salt Gelato Pops: Caramelized honey is quite literally the bee’s knees! Sorry I couldn’t resist making good a pun, about as much as I couldn’t resist this ice pops! 11. Multi-Color Popsicles: These multi-colored popsicles scream summer! 12. Thumbprint Popsicles: These remind me so much of a frozen version of jammy dodger. They are so cute and the sweetheart filling is a fitting touch for a wedding day. 13. Cereal Pops: If like this couple you fancy serving breakfast for dinner these ice pops would be a fun treat for you and yours guests. 14. 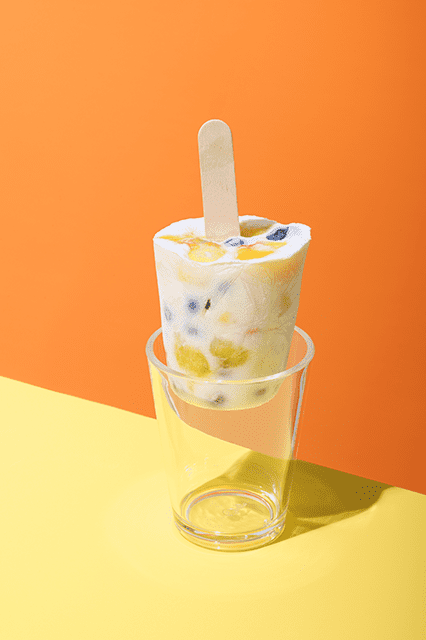 Breakfast Popsicles: Continuing the theme of breakfast for dinner, how about these fun popsicle ideas, Blueberry & mango smoothie or Cold Brew Coffee. A little something to perk your guests up whilst they sit through the speeches. 15. Summer Dreamsicles: These fun creamsicle recipes look too good to eat! How will you be keeping cool this summer? We want to know what you favourite Popsicle recipes are?